Event space in Clackamas, Oregon just south of Portland with free parking, easy load in access, onsite catering and hotel guest rooms. Just off of I-205 and near Clackamas Town Center. Our 20,000 square feet of flexible meeting space can be adapted to your specifications. Our on site sales and catering staff will see to your needs from small corporate meetings and conventions to the most elaborate theme parties and trade shows. The beautifully landscaped garden courtyard with cascading waterfall will compliment your outdoor reception. 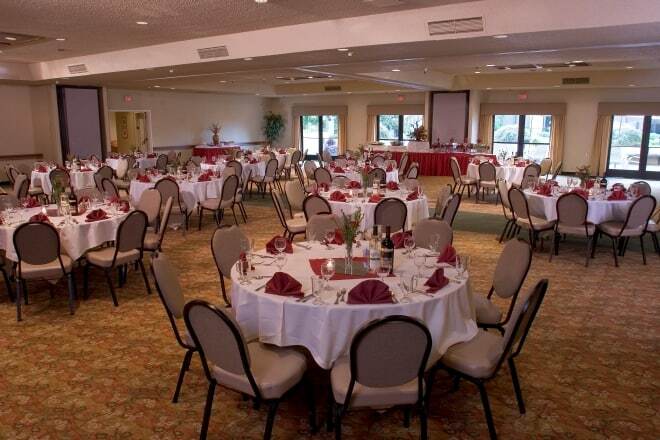 Free parking and easy freeway access makes the Monarch an excellent choice for your event. Both the Pacific Ballroom and Monarch Hall are wired for complimentary high speed internet access, as well as wireless. One wired microphone and podium are provided on a complimentary basis for each meeting or banquet room. All of our meeting and banquet space is ADA accessible. To help you attend to business, the Monarch provides a professional sales and catering staff anxious to assist with any special needs. From executive board meetings to the most elaborate theme parties, the Monarch’s staff will make all the arrangements: catering, audiovisual equipment, meeting room setups and tear down, and arrange for trade show booths. We’ve got the contacts you need for entertainment, florists, photographers and more. In addition to providing catered food and beverage on site, the Monarch also has expertise in providing service to varied venues from corporate locations, yacht clubs, parks and private homes.